One of the customs popular at family celebrations is the use of cascarónes. Cascarónes are confetti-filled eggs that are colorfully decorated. 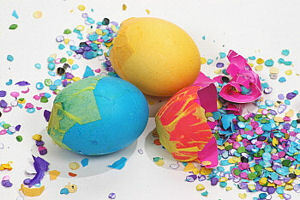 At times, the eggs may also have glitter or other items added to the confetti. The cascarónes are smashed over the heads of family and friends. And, when the confetti flies, it signifies good luck for the recipient. 1. Poke a hole at the wide end of an egg large enough to fill the egg with confetti. 2. Let the egg drain out of the hole into a bowl. You might need to poke the egg to help it come out. 3. Rinse the egg shell and let it dry in an egg carton, large end down. 4. Follow the directions to color your egg with dye, or decorate with colored pens. 5. Put your egg back in the carton to dry. 6. When it's dried, fill it about halfway with confetti, using a small spoon or funnel. 7. Glue a piece of tissue paper to the edges of the hole. Then, the fun begins! Be careful when cracking the cascarónes on someone's head. It's best to squeeze it in your hand first so you do not hurt anyone.